[March, 2018] Quite a while ago I did my last head-to-head tasting so I lust after another one, this time it is this 21-years old HP versus the 25-years old HP (WB id 79566) both from very recent batches. To verify the results I repeated this tasting some days later. Oops, this was unexpected. 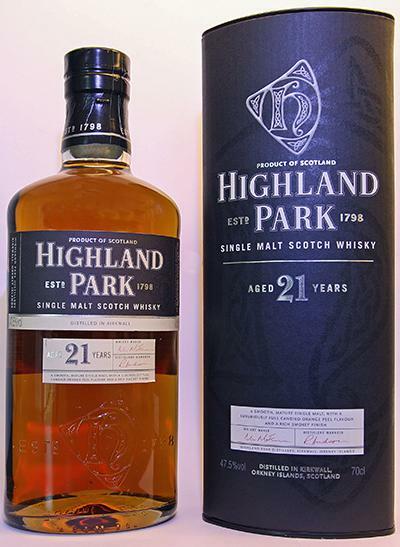 The usually very consistently great 20+years bottlings of Highland Park seem to have degraded substantially. This rather light texture/oiliness cannot match the big mouthfeel and finish of older HP drams (did they hurry the distillation too much?). Both the nose and taste are way simplier than previous batches and somewhat unbalanced with too much wood influence and missing many delicate fruity and peaty aromas of older HP's (according to my taste buds, maybe others see this different). The taste of the 21y is very wood driven with spices and herbs in a rather bitter setting. This is too unbalanced for me as the sweet and fruity flavours hide in the background and are hard to detect. The 25y is better on this dimension but again without being truly great (like older batches). Still this is a fine and complex taste with lots of different flavours, for sure. But I cannot score this above 90 points as this would be unfair to many other fine drams. Some water opens up both the nose and taste of the 21y nicely (a two points difference in my score) but it is not recommended with the 25y as this dram flattens out quickly when reduced by water. The 21y arrives warming and (just a little) coating on the palate with significant astringent moments from heavy tannins and a slight bitterness. This is not my favourite mouthfeel, unfortunately. Luckily the mouthfeel of the 25y is better but still it is not really coating (I expected this from the rather weak oiliness already). At least there are no astringent or unpleasant bitter moments. But where is the trademark great mouthfeel of HP gone these days? The finish of the 21y adds some sweet flavours (sugars) during the medium finish that are highly welcomed because they at least somewhat balance out the drying bitterness. The finish of the 25y is just of a medium length too (the light texture takes its toll) and it dries out at the end (cold ashes, papers). 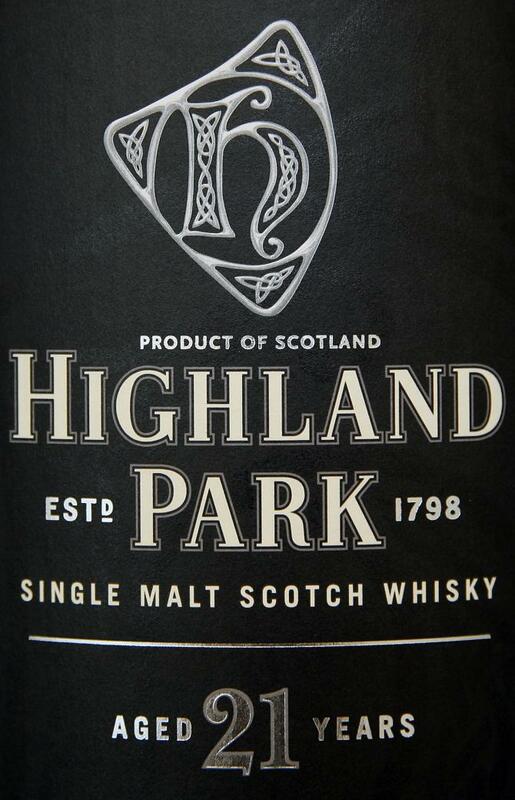 A very fine Highland park, and the youngest of those I really like. Of course, the 25s and 30s are miles away and much more intense, but this 21er is the first big throw in the standard range. First-class harmonious, very elegant, the HP style, which is mainly based on the axis heather honey orange chocolate, is here in great balance and down to the smallest detail as you love HP: fine flavors, not too much barrel influence, Fruit, sweetness and the just right touch of spices make for a completely successful Malt - schöön! Too bad that this standard has now been (re-) listed. long, honey, tangerines, chocolate, honey, vanilla, marzipan, the chocolate dresses the entire mouth, very lightly at the end mint and cucumber and anise ... and again honey and orange blossom ... wonderful! Immediately likeable with dense layers of aroma to attempt to discern. Sweet honey, toffee dark ripe fruits come out to play right away. 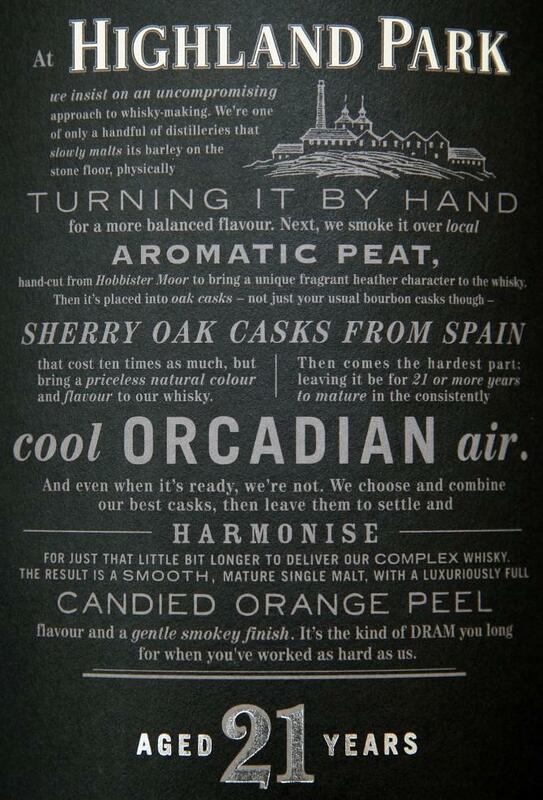 In support there are nutty malts, leather, polish, heather and dusty smoke. Hiding away is a real umami flavour - balsamic vinegar maybe? along with sharp burnt orange and subtle wood spicing, particularly ginger and nutmeg. There's an awful lot going on. Well matured, complex HP. I like it. Full sweetness of oranges and honey. Clove, chocolate, light aromatic smoke. Apples and oranges with honey. Pepper. Chocolate. Tender smoke, burning herbs, a bit of salt and a delicate mineral note first come into the nose. Immediately followed by wild honey, limes, eucalyptus, almonds, marzipan and some sherry. Everything is here, what makes Highland Park good and lovable! Overall for 21 years pretty fresh and lively. Now the whisky shows its age and reveals a downright consistency in the mouth. Wonderfully thick, oily and sweet. White chocolate, roasted almonds, orange marmalade and distinct herbal notes and intense spiciness. The creamy mouthfeel does not stop at all. The medium-long finish is carried by marzipan, almond syrup, white chocolate and the typical, slightly herbaceous, smoke of Highland Park. Later, caramel and vanilla strengthen. Also on the finish is the still existing creamy and soft sweetness. Yup...another HP 21 review. Still pretty good and worth trying. Soft honey and peat, wisps of sweet smoke, light grassiness, vanilla, and butterscotch. Sweet arrival. Honey with faint peat and smoke, bread, then develops into lightly spiced honey and imperceptible peat. Sweet, light peat. Herbal, grassy, and drying in that pleasant HP way. There is a recurring and pleasant tannic spice once all has subsided. Have to mark this down one point from 91 to 90 as drinking this again after having the HP 25 48.1 & HP 30yo 48.1 recently I am now finding bitterness in both the mid palate and finish. 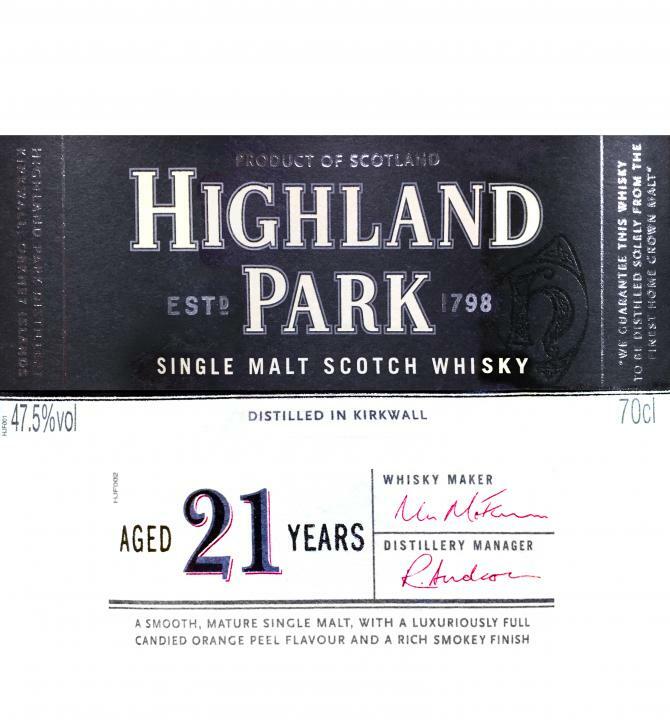 It's been a while: I don't remember trying HP 21 since Jan 2013, and that was at a whisky fair, where one friend had filled his glass with the 18yo and another with the 21yo, and together we 3 preferred the 18yo. Have things changed? YES. I find the nose with its raspberry jam after some time in an oven to be delightful. Sweet and tastefully sherried, elegant and soft without being toothless. The body is plain joy on the tongue, and the taste and the waxy, sherried finish leave me wanting for more. I tried it with some water, but it didn't seem to work as well as without.